It may come as a shock to many amateur gardeners to find that once they have tilled, planted, weeded, watered and finally watched a flower miraculously appear, their job is not yet finished. The higher that flower reaches, the more precarious her situation grows. All it takes is one rollicking thunderstorm – one gusty day in an otherwise fair week – and your fabulous flower is flat. If you garden fairly seriously, staking is one of the necessary evils of life. You can put it off for awhile – just as you might the balancing of your checkbook – but sooner or later you’re going to pay a price. Now, with some fast talking and low-level groveling at the bank you may be able to extricate yourself from a sticky situation, but no amount of pleading will make your delphiniums stand up straight after they’ve floundered face-first into the mulch. Injuries may include, but are not limited to, crushing, tearing, breaking and yes, even amputation. Mother Nature takes no prisoners. Staking plants is a tedious job; but this gardener finds it far more tedious to anticipate the striking contrast of Easter Egg Iris against Sensation Allium….only to find them all collapsed in a sorry heap of foliage and flower one short day after blooming. Like it or not, the professionals don’t fool around here. Next time you are mesmerized by the incredible border displays at the Huntington, or Longwood, or Sissinghurst for that matter, take a deeper, impertinent look at the underwear on those beauties. It may not be immediately noticeable – a skilled gardener can stake a stand of digitalis with such finesse that visitors’ eyes skim right past without ever seeing it. With only two to four weeks of bloom from such favorites as Phlox, Peony, Alcea and Delphinium, every minute counts, and stems are often staked before they actually flower. So, as stewards of our little Edens, we have two choices. Either grow dwarf varieties and proven winners in the Rigidity Sweepstakes (such as Leucanthemum suberbum “Becky” or Echinacea purpurea ‘Magnus’); or learn how to stake our precious plants with maximum speed and minimal injury. Mt. Everest Allium, nicely restrained. I choose the latter. But I do rely on favorite methods and tools. 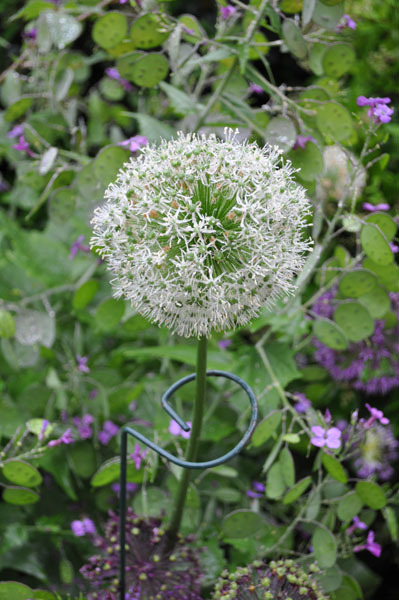 For individual blooms, I absolutely love the green coated metal stakes with a spiral end that allow the gardener to slot the stem of the plant in the spiral and do away with any thought of twine or ties. These are completely reusable and come in several sizes. If I haven’t been diligent in my staking and am seeing a bloom start her journey towards the ground, I can quickly grab one of these stakes and stave off disaster in a second. Bamboo is a trusted favorite, but you must have twine or ties. I tend to use bamboo when I am staking foliage-heavy plants with blooms that pop just over the line of foliage. Individual staking is not called for in this case, so I put in about five bamboo stakes and create a spider web of twine within the plant’s framework. If you do this early enough, the plant simply grows through its support system and looks incredibly natural. 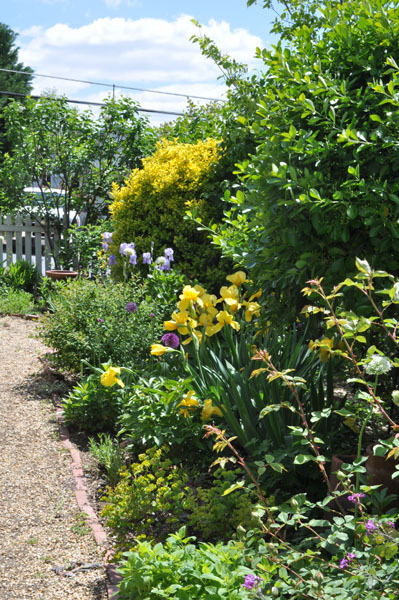 Another way of supporting bushy plants that will flop over with the weight of their sizable blooms – such as peonies – is to ‘corral’ them from the get go with twine fastened around stakes inserted around the perimeter of the plant. These are also available to the gardener as pre-made metal hoops with stakes. Twine is not your only choice. For tying up woody plants I often use loosely fastened zip-ties or Adj-A-Tye (a type of reusable chain lock that can be cut to measure). Less hardy plants get the kid-glove treatment with lightweight green tie ribbon. However you decide to stake your plants, let tenderness guide you. If you tie a stem too close to a stake, the wind may not blow it down but it will certainly chafe against its support. Too tight with the twine and you will risk decapitation. Flowers are fragile and unforgiving. Too much work? 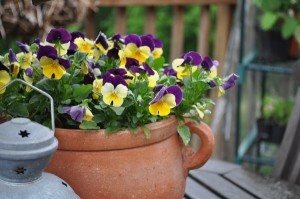 Pansies don't need staking. Staking is that dirty little secret of gardening that doesn’t often get talked about. Those in the know, do it. Others will always wonder why people grow things like Montauk Daisies, Asters and Delphinium, as they spend half their lives face down in the mud. The next time you are buying a plant, take a moment to look at the label for growth habit. Then decide whether or not you should put it back and look for a smaller cousin, or head over to hardware and buy a pack of stakes. Good point John! I’ve got a Teasing Georgia rose that is held up by a ring of Lunaria – works for me!